I hope that you have had a good, restful summer despite the high temperatures in town. No such problem in Angleterre this summer! Walking around Aix this week was lovely – I had almost forgotten how blue the sky is, how colourful the market is, and how simply chic the Aixois are. I had also forgotten how to eat in a pavement café in a Mistral, simultaneously hanging on to paper napkins, hat, hair, while enjoying the food. 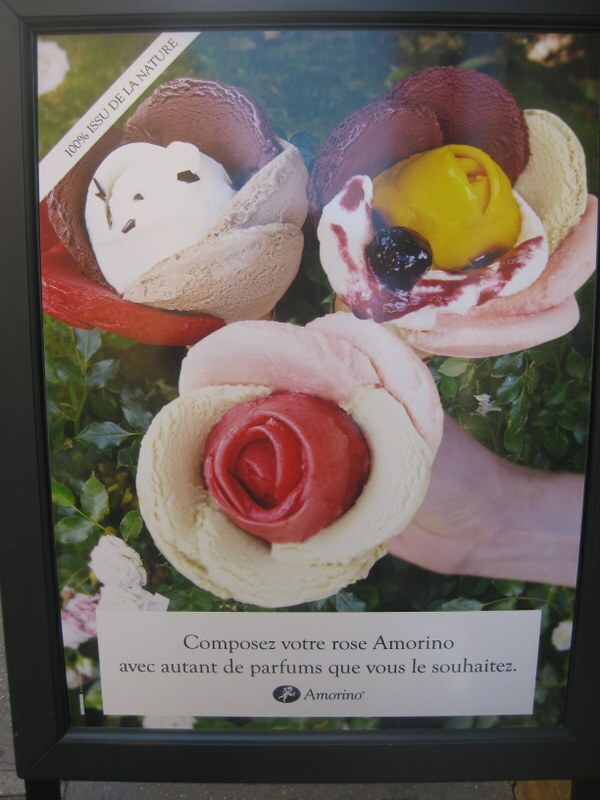 And aren’t we lucky to be able to order ice-cream shaped like roses – take a bow Italian gelateria Amorino in rue Espariat. But there are changes. I was so sad to see that Le Petit Resto, formerly La Cantine Vegetarienne, is no more. 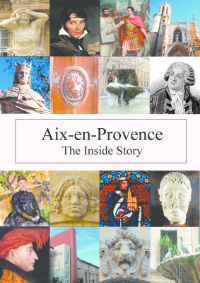 It was in the very Provencal place des Tanneurs and provided a home-cooked vegetarian-friendly lunch. Anyway it’s now called Ojums without a veggie dish in sight. 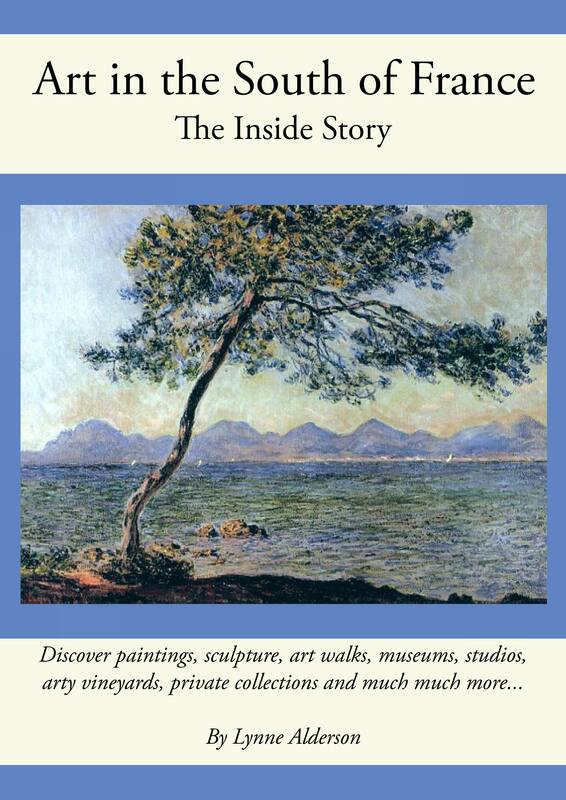 I see that the work at the Espace Cézanne is ongoing and there are now illustrations showing us what to expect. 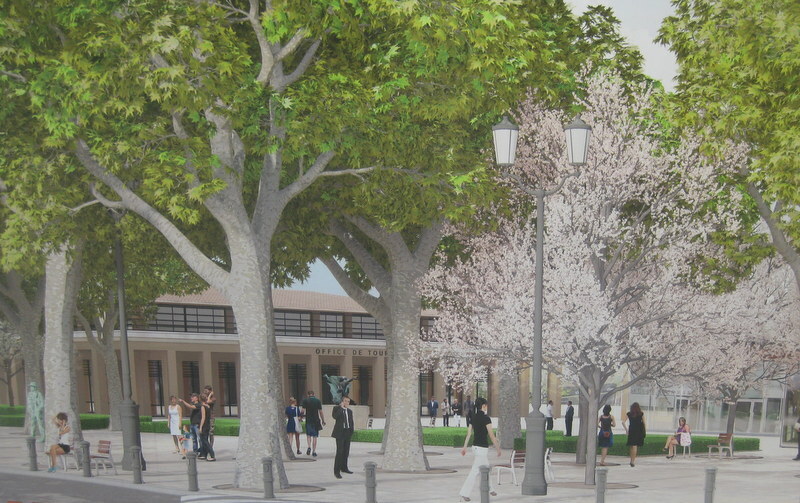 It’s basically lots of paving, sculptured shrubs and flowering cherry trees. No loos as I was hoping for, but the large paved area will provide space for activities like market overspill at Christmas. I really had hoped the Cézanne statue would have been raised up to provide a focal point but that doesn’t seem to be in the design. Talking of statues, I wonder what the reaction is to the Bernar Venet sculptures installed for the summer months? 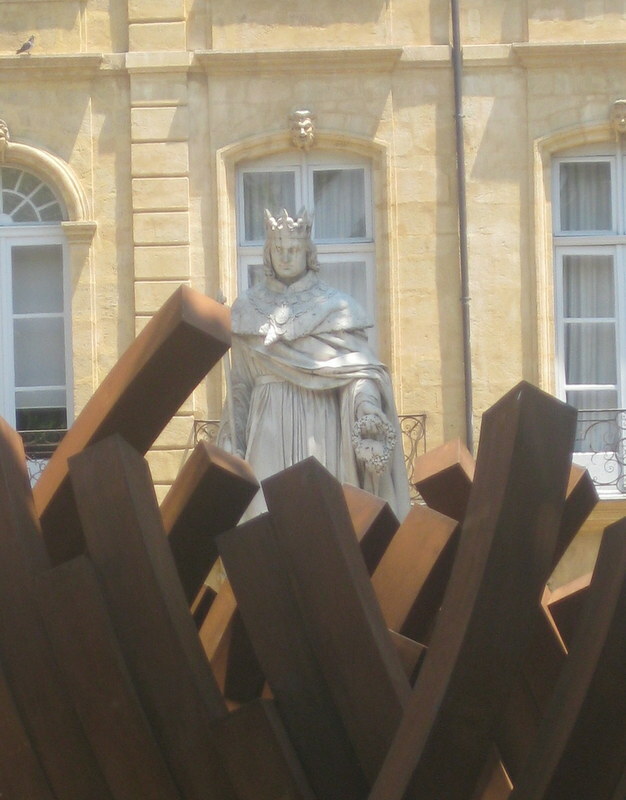 The photo shows the one at the top of the Cours with King René looking down on the art-work, one of four in key town locations. 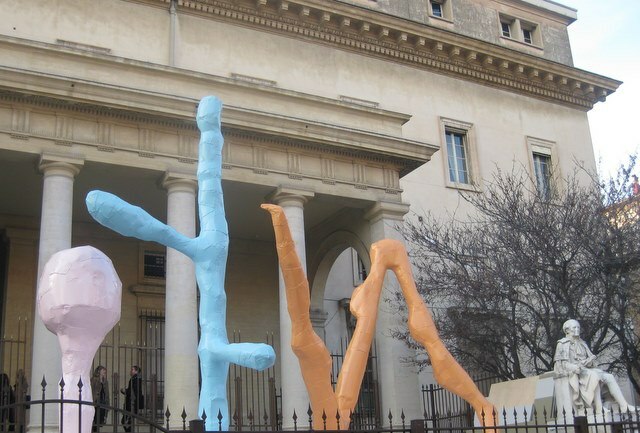 Aix really likes to push the envelope with its sculptures – we had large naked men at the Rotonde a few summers ago and who could forget this one (below) which ushered in the Year of Culture in 2013? What was that about? But for me nothing will ever beat those dotty trees in the cours Mirabeau! And finally, another change is this year’s invasion of mosquitos! Everyone is talking about them – not only the number this summer but also the appearance of the striped Asian tiger-mosquitos which are encroaching on Provence. Ouch. Read more in my next post! …….. Welcome back! I was just thinking about how much I miss your posts when you are on hiatus. We were in Provence for 3 weeks in July and really wanted to go to the Canaletto exhibit but the weather was so hot I couldn’t bear to move! Love your photos- I want a pair of those shoes, and a “rose” ice cream. And we absolutely agree with you about your hopes for the Espace Cezanne…too bad that your vision isn’t the one being implemented….the space seems far too sterile and uninviting in the heat, when we were there.